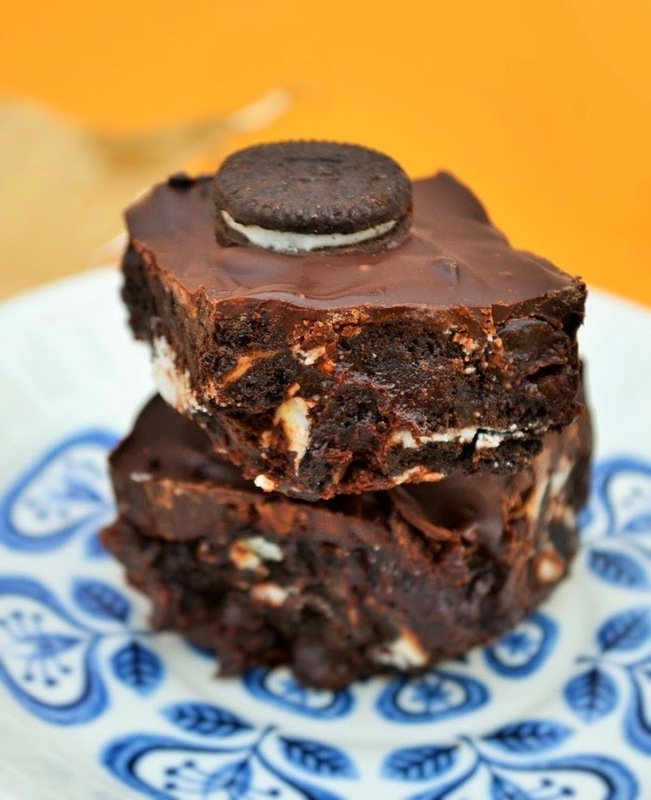 Carrying on the theme of Oreos, I bring you Oreo Chocolate Tiffin. An easy no-bake traybake (that's a bit of a contradiction, isn't it?) studded with Oreo biscuits and raisins. Even better it's suitable for vegans. Yes I made this one for my lovely husband, although Cooper and I tucked in too. It was easy to make, but not so easy to cut smoothly, so I'm afraid the photos leave a lot to be desired. I should have scored the top layer of chocolate while it was still soft and it would have cut neater. Oh well you live and learn and it didn't affect the taste one little bit. It'll be messy where its going as my mother would say. Are you drooling looking at this photo? I am! If you don't have dairy free spread you can use butter instead and you can also substitute the dark chocolate with milk chocolate if you prefer it. Either way, it's a real treat and a total chocolate hit! 1. Line a brownie pan with greaseproof paper or foil lined greaseproof paper (fabulous stuff!). 2.Heat the dairy free spread gently in a pan with the agave syrup and cocoa powder, until melted. Take off the heat and stir in the the crushed & broken Oreos and raisins until well combined. 3. Pour the mixture into the brownie pan and smooth down. Chill in the fridge for 20 minutes. 4. Melt the chocolate in a glass bowl over gently simmering water. Make sure the base of the bowl doesn't touch the water. Once the chocolate has melted, pour it over the biscuit mix and smooth evenly across the biscuit mixture. 5.Pop the mixture in the fridge to set, before cutting into 16 squares with a sharp knife. 6. Enjoy! 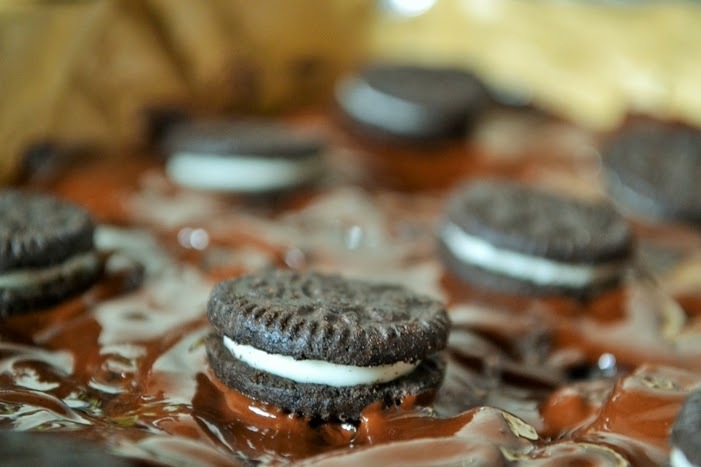 Here are a few more Oreo and No-Bake recipes for you to try. 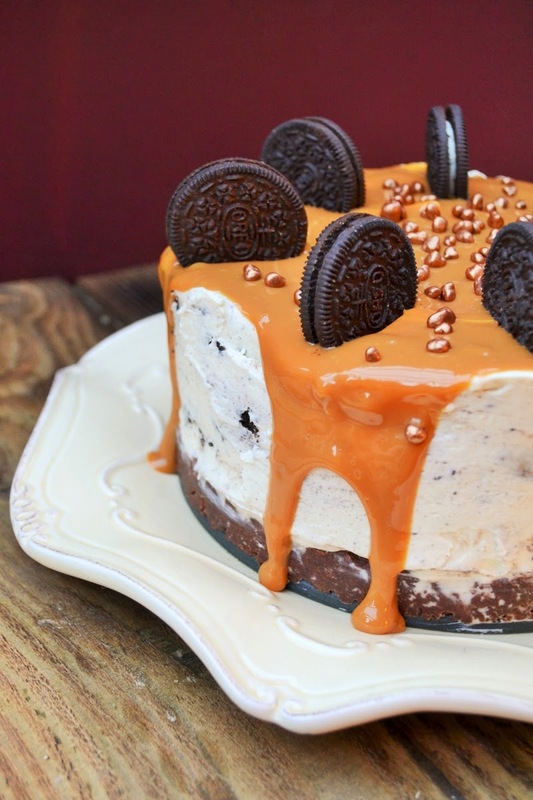 I am an oreo addict so always happy to find more recipes like these. Oh me too Bintu. I am quite a new convert to them. Oh yes maybe don't indulge until then. I don't want to be blamed for you not fitting into your wedding dress. Mmm I know it's too early in the morning for them, but I want to make this right now! Yum,it looks so delicious snd indulgent, hard to believe it is dairy free! I know, my hubby was delighted! Haven't made a no bake cake since the Brownies (the girl's group that is, not the cake) - not sure why and need to recitfy this! You really must they are so easy but pretty darn special. Oreos are my weakness. One always leaves to the whole packet. Would love to try this out. Your Oreo recipes are driving me wild!!! I do not take any responsibility Stuart lol! I love oreo and this is definitely look lush! So moist and most of all it is no bake! Fab especially when you need to make more than one dessert for a party and no room in the oven to bake! It is rather decadent Eileen and as you say an easy no-bake. Definitely worth making. I made this ready for a hen weekend away and took it out of the fridge the morning of and it hadn’t set atall, still completely gooey! That's strange it always works for me. I wonder if the type of spread you used had anything to do with it or if your tray was maybe deeper than mine? Other than that I am at a loss. This looks soo good! I now have a vegan colleague at work so i know what i'm making for our next meeting! Are there particular brands of dark chocolate suitable for vegans? That is kind of you. There are so many brands now. Check your local supermarket. Sometimes own brand are ok too. I use Lindt, but sometimes pick up other brands.